72 F A ll 2018 Practice l ink.com features For more information, contact Holly Lestage, Provider Recruitment Manager 508-973-2765 lestageh@southcoast.org More than medicine. Southcoast Health is one of the largest and fastest growing health systems in New England. Since its inception in 1996, Southcoast has become a sought-after destination for health care professionals. As a thriving part of the New England medical community, Southcoast Health offers practice excellence in an environment you want to call home. 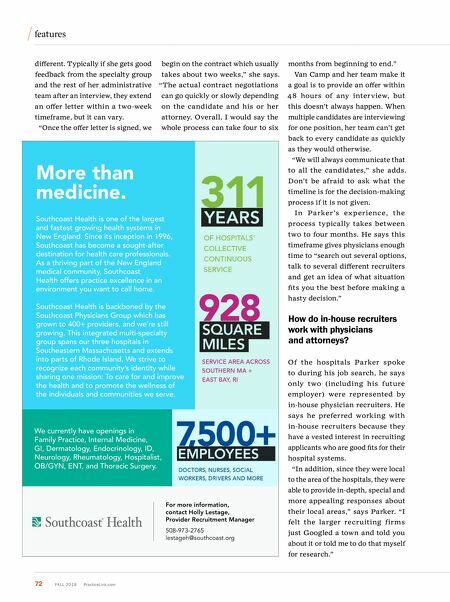 Southcoast Health is backboned by the Southcoast Physicians Group which has grown to 400+ providers, and we're still growing. This integrated multi-specialty group spans our three hospitals in Southeastern Massachusetts and extends into parts of Rhode Island. We strive to recognize each community's identity while sharing one mission: To care for and improve the health and to promote the wellness of the individuals and communities we serve. 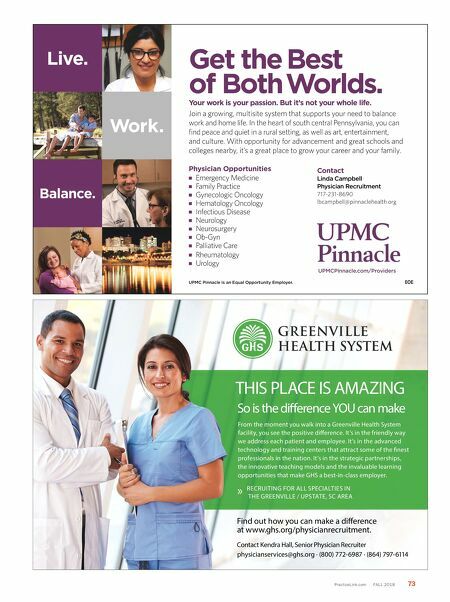 We currently have openings in Family Practice, Internal Medicine, GI, Dermatology, Endocrinology, ID, Neurology, Rheumatology, Hospitalist, OB/GYN, ENT, and Thoracic Surgery. different. Typically if she gets good feedback from the specialty group and the rest of her administrative team after an interview, they extend an offer letter within a two-week timeframe, but it can vary. "Once the offer letter is signed, we begin on the contract which usually takes about two weeks," she says. "The actual contract negotiations can go quickly or slowly depending on the candidate and his or her attorney. Overall, I would say the whole process can take four to six months from beginning to end." Van Camp and her team make it a goal is to provide an offer within 48 hours of any interview, but this doesn't always happen. When multiple candidates are interviewing for one position, her team can't get back to every candidate as quickly as they would otherwise. "We will always communicate that to all the candidates," she adds. Don't be afraid to ask what the timeline is for the decision-making process if it is not given. I n Pa rker's ex perience, the process typically takes between two to four months. He says this timeframe gives physicians enough time to "search out several options, talk to several different recruiters and get an idea of what situation fits you the best before making a hasty decision." How do in ‑ house recruiters work with physicians and attorneys? Of the hospitals Parker spoke to during his job search, he says only two (including his future employer) were represented by in-house physician recruiters. He says he preferred working with in-house recruiters because they have a vested interest in recruiting applicants who are good fits for their hospital systems. "In addition, since they were local to the area of the hospitals, they were able to provide in-depth, special and more appealing responses about their local areas," says Parker. "I felt the larger recruiting firms just Googled a town and told you about it or told me to do that myself for research."